John Charles COULTER (Nov 1840 – bet. 1914-1917) - the mystery surrounding his death and an exploration of his possible family connection to the COULTERs of Carrickastuck. The knowledge of the story is thanks to a series of emails in 2009 from Lainey (Elaine) Machovsky. April 18, 2012: Since the cause of his death is now clear, I have done a rewrite of the start of this page, but have left much of the research section intact. 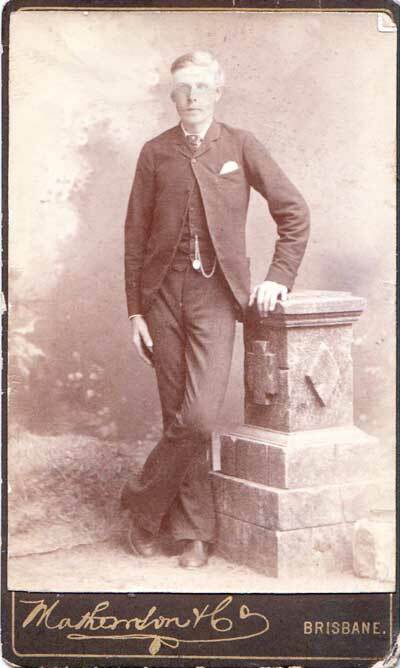 John Charles COULTER - probably taken for his wedding, or shortly thereafter. Hence, abt 1870. Photo shared by Lainey (Elaine) Machovsky. He was murdered in his hotel room in Ireland. Scotland Yard was involved and John Charles was found to have been poisoned. The funds John Charles had received from his financial transaction had mysteriously disappeared. His son, John Gordon Coulter, went to Ireland to settle the matter. John Gordon suspected a member of the Tracy/Treacy family and pressed the matter with Scotland Yard. The Yard apparently indicated that it had perhaps been an inside job -- such as hotel staff. Certainly the two TREACY's and COULTERs had a century long relationship that involved leases of land and possibly marriage. To complicate things, the two families also straddled the faith divide with COULTERs being Church of Ireland, and the TREACY’s being Catholic. In the early 1900s in County Louth, this was a challenging divide to straddle. From the distance of America, it is easy to see how such a story would seem to be a fit, however it started to unravel as one of the descendents shared what she knew with me. The next development was that I stumbled accross John Charles COULTER's will. (Stumbling is one of my most effective research methods - I found it when I was looking for something else.) The next thing that happened was tthat a fellow OLIVER family researcher, Maria Beattie - a harpist in London, kindly responded to my call for help, and gave us his probable date & place of death: Dundalk, 1919. His death certificate, found recently by Lainey (Elaine) Machovsky was the final slam dunk. The death of John Charles COULTER was irrefutably a death resulting not from murder, but from natural causes: general debility, intercupsular, fracture of hip, bronchitis (10 days). He was age 82 and died June 17, 1919. From other evidence, it seems he was born November 1836 (American Census docs say November, and his age at death gives a year). Since the certificate was signed by “cousin” Patrick TREACY, it would seem likely that the families had intermarried. After all, a James TREACY of Philipstown was named as a trustee in an 1851 document concerning lands and involving John Charles COULTER’s brother, Henry, and their mother Ann. Given that Ann COULTER was widowed a year earlier in 1850 when her husband Ralph COULTER died, it is quite possible that she was a TREACY, and possibly also a sister of James. I have not done any work on this part of the research myself. John Charles COULTER (Nov 1840 – bet. 1914-1917) was born in Ireland and emigrated to America in 1870 with his bride, Margaret GORDON (1848-1922). Prior to emigration, he was a school master. His daughter recalled that they had left Ireland because of religious unrest and because their flax fields had recently been burnt to the ground. He kept in touch with family back in Ireland as well as with a Ralph COULTER who was in Australia at the time. Ralph was possibly a brother or some other relation. The picture beneath, taken in Brisbane is possibly this same Ralph COULTER. John Charles COULTER’s father’s name was also Ralph, but nothing more is known of him except that he was listed on his son’s marriage certificate as a farmer. John Charles COULTER went back to Ireland at least twice after his initial emigration. In 1899, he returned to bring his widowed father-in-law, John GORDON, and his widowed sister-in-law, Ada (GORDON) BELL to Minnesota in order to reunite the family. Then he returned sometime between 1914 and 1917 to settle a financial matter. The details of this visit come from the recollections of his daughter, Dorothy, as they were relayed to one of her grand-daughters. Apparently, the financial matter that he went back to sort out was either a will or some other sort of land transaction. As for the rest of the story (as it was handed down in the family): he was murdered in his hotel room in Ireland. Scotland Yard was involved and John Charles was found to have been poisoned. The funds John Charles had received from his financial transaction had mysteriously disappeared. 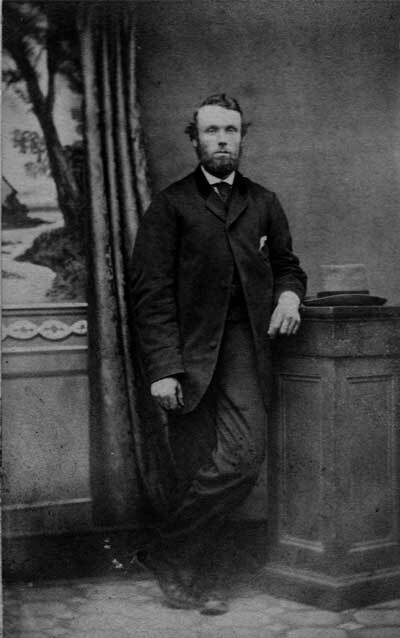 His son, John Gordon Coulter, went to Ireland to settle the matter. John Gordon suspected a member of the Tracy/Treacy family and pressed the matter with Scotland Yard. The Yard apparently indicated that it had perhaps been an inside job -- such as hotel staff. ... John Gordon buried his father somewhere in Ireland and subsequently returned to Minnesota. If we are looking for a likely townland where the family of John Charles COULTER most likely came from, Carrickastuck, Parish of Philipstown, Co. Louth comes to mind. It was a home to a COULTER family from at least as early as 1734 and likely back into the late 1600s. A Ralph COULTER (d.1850) lived at Carrickastuck in the early to mid-1800s. His occupation in an 1803 deed was listed as “tanner”. Deeds mentioning him are at: 1803 Dec 5 & 1803 Dec 7 and 1851, April 28. The names of both John and Charles also crop up in this line of the COULTER family. A Ralph COULTER was listed in an 1842 Voters list as a freeholder resident at Carrickastuck. He is likely the same Ralph COULTER as the one who died in 1850. In 1841, A Ralph COULTER was involved in a forgery. Could this have been an element in an intergenerational family feud? What does it say about the character of Ralph COULTER? At this remove, it is hard to say. SOURCE: Freemans Journal 28 June 1841. "he was an extensive farmer, and well able to give substantial bail" Again, this could be the same Ralph COULTER who died in 1850. Also in 1842, there was a case described in the Spring Assizes: Expenses Queen v. Tracey, County of Louth, total £10/1/5. SOURCE: http://traceyclann.com/files/louth.htm Was there a connection between these TRACYs and the COULTERs of Carrickastuck? In the mid 1800s, agrarian unrest was a reality in this part of Co. Louth. A Samuel COULTER who lived nearby at Shortstone and who was distantly related was murdered in 1851 and no conviction was ever realized in the murder. The destruction of harvests, burning of buildings and wounding of animals at this time prompted many COULTERs to leave for less politically unsettled places and is part of why the COULTER name occurs less frequently in Co. Louth in censuses after the mid-1800s. A William COULTER of Barronstown, Parish of Barronstown, Co. Louth (same neck of the woods) died in April 14, 1913. In the 1911 Census, he is an 83 year old widower and retired excise officer and farmer. He was Presbyterian and living with a servant, Mary HUGHES, age 70 who was a Roman Catholic. He would have been born in 1828. His home was single room house with a thatched roof and there were 14 farming related outbuildings, all of which he owned. This humble housing is in marked contrast to the value of his effects at the time of his death (£1,314 16s. 11d). He could have been a brother of John and Ralph jr. since a brother named William is listed in the 1851 deed. His death in 1913 could have been the event that triggered the return to Ireland. The amount of his estate would warrant it and it seems that he was a widower without known issue. In the 1911 census, there was an Anne TRACY (age 75), widow and her son & daughters living with her at Carrickastuck. They were a farming family. There were no longer any COULTERs living at Carrickastuck. There is no evidence either way of anything untoward that resulted in the TRACYs having title and occupying lands at Carrickastuck. Also in the 1911 census, there is a COULTER family in Ballymena, Co. Antrim with a set of first names that echo what we find in the Carrickastuck COULTER line: Samuel (the family head; age 37; a power loom tenter; Presbyterian; living in a 9 room house), John, Robert, William, Ralph, Mary. ........ 2 Ralph Coulter NOTE: He is possibly the one who went to Australia. ........ 2 John Coulter is possibly the John Charles COULTER b. 1840. Obviously, this summation is a product of a lot of “guess and by golly”. Perhaps others will be able to either refute these hunches or else fill in the blanks. In time, we may be able to corroborate the case for the family roots of John Charles COULTER and the story of his possible murder. Margaret Gordon (b: 31 May 1848 Island Magee, County Antrim, NIR; d: 17 Nov 1922 Newton Township, Otter Tail County, Minnesota, USA), living first in Ohio, next in Michigan, and then finally settling in Newton Township. NOTE: I wonder if it might have been the harvested flax which was burnt rather than the flax fields. Does a flax field, particularly in the “soft” weather of Ireland, burn to the ground? Perhaps others can educate me here. When Married. 20th July 1870. Married in the Parish Church, according to the Rites & Ceremonies of the United Church of England & Ireland, by licence., by me, G. B. Sayers. 20th July 1870.This Marriage was Solemnized between us, John Charles Coulter and Margaret Gordon In the Presence of us, Henry W. Richard and Ada Gordon..
QUEEN'S BENCH CHAMBERS - SATURDAY. The Honourable Mr. Justice Burton sat in chamber on Saturday to hear motions. The Queen, at the prosecution of James Carroll and Terence O'Neill, v. Ralph Coulter. Mr. Teeling applied, on the part of the prisoner, who was confined in the gaol of Dundalk, the he should be admitted to bail. The prisoner was committed to gaol on the 17th of May, on the information of James Carroll, which stated that Coulter, in person with another person unknown, came to him on the 24th of March last, and asked him to cash a bill drawn in New York, in favour of a person named Terence O'Neill of Castleblayney, in the County of Monaghan, for 20l. 9s. 1d. The prosecutor consented, and gave the money to the unknown man, who represented himself to be Terence O'Neill, but he had afterwards to pay the amount over again to the real Terence O'Neill, who was joined with him in the prosecution. Mr. Monahan, Q.C., opposed the motion on the part of the crown. He said that the charge was one of forgery. Both the prisoner and his companion were alike implicated in the offence, as they came together with a forged bill, and had, to all probability, divided the money afterwards between them. Mr. Teeling said the prisoner made an affidavit, in which he stated that a strange man, whom he had never before seen, and who represented himself as Terence O'Neill, came to him in Dundalk on the day in question, and said that he was recommended to him by the postmaster of Castleblayney, who was the prisoner's friend, as a person who could assist him in procuring cash for the bill. That the prisoner then accompanied him to Carroll's shop, and, after introducing him, went away, and never saw him more. That Carroll did not pay the amount of the bill for six days after, until he obtained advice as to its authenticity from Liverpool, and that the prisoner was not present on the second occasion when the amount was paid, and that he was an extensive farmer, and well able to give substantial bail. Probate of the Will of William Coulter late of Barronstown County Louth Revenue Officer (Retired) who died 14 April 1913 granted at Armagh to Charles Joseph McGahon. Solicitor Effects: Effects £1,314 16s. 11d. Corroborating evidence can be found in the gravestone at the Kane Old Graveyard : COULTER Sacred to the Memory of Ralph COULTER Barronstown also his son William who died 14th April 1913 Erected by the above William.